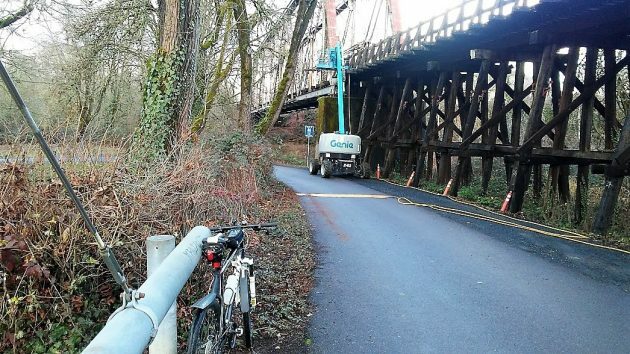 The trestle bridge repairs as they appeared on Monday afternoon, looking west from Bryant Way. Much of the activity had been out of the public eye, but in recent weeks it progressed toward Bryant Park, where I could not help but take notice. I waited till one of the workers lowered himself to the ground on a bucket rig and asked him what they were doing. Replacing stringers, he told me. Trains can use the track at night, when the work has stopped. This project, Williams wrote, is scheduled to be completed in March. It is costing the railroad more than $1 million. I had asked him how old this section was. “The steel truss was built in the late 1800s (for steam locomotives that imparted much greater loads than today’s equipment), and the approaches were built in the 1930s, according to records,” Williams wrote. So, if the three-ply stringers lasted about 80 years, I’m assuming the new four-ply replacements will last as long. This suggests that nobody at the P&W — or the BNSF railroad from which the Oregon shortline leases this old Oregon Electric track — is still thinking of somehow replacing or rerouting the line any time soon. The Hamilton company doing the work is based in Coburg. Its rail division has accomplished some big and complicated projects in recent years. 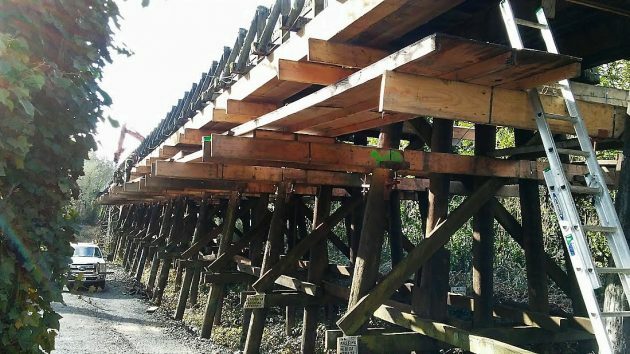 One was replacing the Union Pacific mainline bridge across the Willamette River at Harrisburg in 2013-14, which it managed to do while allowing both Amtrak and UP freight trains to keep to their schedules. This was on Jan. 9 near the entrance to Bryant Park. Thanks, Hasso. There’s a lot we wouldn’t know about if it weren’t that you are out and about every day and then write your blog. You are much appreciated. The Oregon Electric was, wait for it, originally an electric railroad in the state of Oregon. It used electric freight and passenger motors, one of which was just returned to Oregon from Canada, and is now at the Oregon Electric Railway Museum in Brooks, OR. Also the Oregon Electric was not built until the early 1900s. You should be able to see the date of the truss bridge near the top on either end. Glad to hear they are using wooding stringers (even if laminated) rather than concrete. Hopefully these will last a long time, but remember the originally stringers were made from tight grain old growth fir, and modern timber is young soft junk. Also fun fact, this is about the only bridge of know of that crosses a river twice on a single bridge. Look at it on google maps. The passenger line down 5th didn’t need this bridge, as the bridge starts and ends on the east side of the river.